Properties: Sweet, balsamic and spicy this oil is also wild and organic. 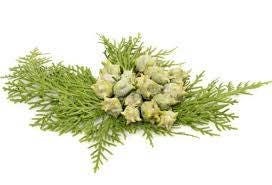 Cypress oil is a very pleasant evergreen aroma, smoky, woody, dry and slightly nutty. A great oil for times of sadness. Soothing and positive. Blend with rose oil for a blend that assists uplifting mood, and use in a diffuser or as a massage blend. Blends well with cedarwood and pine, mandarian and orange, sandalwood, lavender, clary sage, juniper, rose, jasmine, and more. Just as described and smells great in my bathroom.